Annie Ernaux’s book begins with the flat statement, “My mother died Monday the seventh of April at the retirement home of the Pontoise hospital where I had put her two years ago.” A Woman’s Story is not a novel, autobiographical or otherwise. In French, the title is Une femme, which could be translated A Woman or A Wife; the word is the same in French. The ambiguity of language is only one of the many things happening in this volume, which finds itself somewhere at the juncture of literature, history, sociology, and private journal of grief. Ernaux begins with her mother’s death, but continues with her life. Her mother was born and lived all her life in a small town in Normandy. Ernaux understands the very small gradations of social class between farmer and factory worker, factory worker and shop-worker, shop-worker and shop-owner with enough leisure time to farm; she recounts her mother’s huge personality, her laughter, her rages, her Herculean efforts to push her daughter Annie up those tiny rungs of the social ladder. She discusses all kinds of intimate details of her mother’s life — her parents’ marriage, her mother’s painful incomprehension before her daughter’s intellectualism, the alcoholism that killed most of her aunts and uncles. All of this is placed in its proper social context, sometimes with footnotes: the number of Normandy schoolgirls who dropped out of high school, for instance. Why the historical approach? Why so distant from her mother’s life? Because Ernaux’s grief is so great that she cannot trust herself to write about it more personally. She is trying to give her mother life, create her mother again through words, in as real a way as she can — give birth to her, in a way — and she fears to overwhelm her mother’s essence with her own grief. So she distances herself, makes a second mother and a daughter who is not herself. Over and over she makes reference to her own writing process, and touches her grief tentatively, like a bruise. Is she better? No, not yet. But the words have had their effect. She has taken her mother, who lived all her life in the world of things, and has made her into a story — taken her into Ernaux’s own world, the world of ideas, and given her a voice she never had during her life. 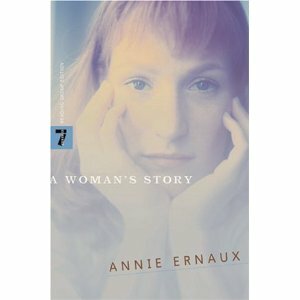 A Woman’s Story is, of course, the story of Ernaux’s mother, but it is also Ernaux’s story. It’s full of specific details — a woman’s story, not any generic woman’s story — but the sociology says that much of it is also true of thousands of other women, perhaps of me or you or someone you know. It’s a short, striking, perfect little book. Find it and read it and be glad you did. This sounds like a very beautiful book. I doubt I can ever read it, though I’ll keep an eye out for this .. just reading the review had me almost in tears .. so poignant! It is a powerful book, but for me, it was never so sad that I found it difficult to read, and it’s certainly never manipulative or sentimental. Ernaux’s style is straightforward, if not linear. Do keep an eye out for it. This does sound poignant. I’ll have to look for it, it sounds like one that is so satisfying even while being emotionally charged. You put your finger on it, Rebecca — it’s tremendously satisfying. Ernaux is never sloppy, even during her most charged moments. It’s a lovely book. What a wonderful review! I loved this when I read it years ago, and you make me feel like going and picking out another of Ernaux’s bittersweet accounts of her life. 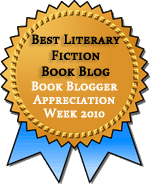 I don’t know if you’ve read La Place, the one she got the prize for — it’s kind of a companion piece to this one, as it’s about her father. If you haven’t read it, that might be a good place to start. I also really like La femme gelee. Well, parts of it are. But parts of it are also funny, or engaging in other ways. She does write about life as much as she writes about death. Give it a try and see. This sounds so interesting, and I’ve never heard of it before. :-) I love it when I read a review of something so completely off my radar. On the wishlist it shall go. Thank you Jenny. I’m glad to put it on your radar, Victoria — her work is all basically like this, autobiographical, dense, worth working through. I love The Frozen Woman if you ever get a chance to read it.